I live only a couple miles from the Guadalupe River. Recently, with Everett Deschner as my guide, I walked along a creek that feeds this river, and he showed me dinosaur tracks imbedded in the stone creek bed. The tracks were quite visible, made by a young half-ton plant-eating dinosaur while walking through the area. Everett on right. Photo by Linnea S.
Deschner is the vice president of the Heritage Museum of the Texas Hill Country, not far from Canyon Lake. 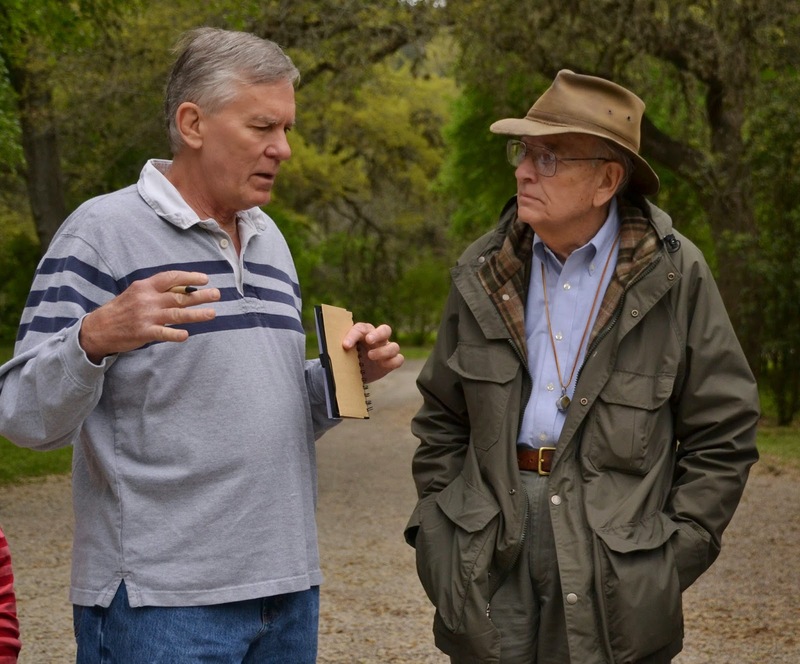 He explained that the Hill Country didn't exist at the time of the dinosaur, which was about 100 million years ago. At that time, this area was a flat, low-lying marshy area sometimes covered by the sea water of what we now know as the Gulf of Mexico. He went on to explain that we can now see these tracks in the stone because of a series of chance events over eons of time. First, the dinosaur walked through an area covered by moist tidal algae. His great weight would be enough to create deep tracks. Not long after that, hot dry weather dried the algae, preserving the shape of the tracks. Tides brought in mud, which filled the tracks. Over millions of years, sediment was deposited layer upon layer until the tracks were covered by about 10,000 feet of sediment. The great weight of all this mud created intense pressure and heat, which caused the algae to slowly harden into stone. Millions of years later, this environment was pushed up by the movement of the continents. Then, after millions of years of weather and erosion, valleys, creeks and rivers formed what we now know as the Hill Country in central Texas. The creek I saw had eroded the sediment down to the layer of stone, making the tracks visible. 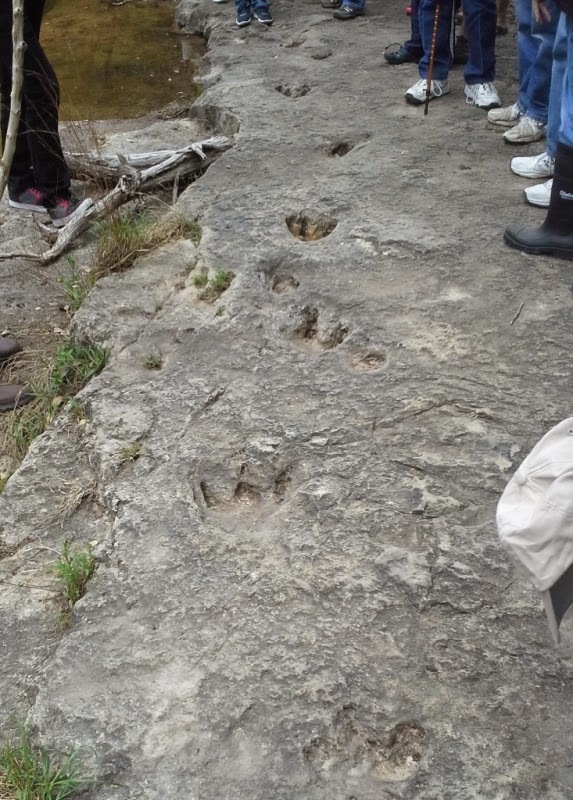 Dinosaur tracks in Texas are found only in the Hill Country. The land west of this region was formed before the age of the dinosaurs, so no tracks are found there. The land east of the Hill Country was formed after the age of the dinosaurs. Deschner told me that there are about 60 known dinosaur track sites. The best known site is at Glen Rose, Texas. I've seen those tracks, but the ones in the creek near my home were equally impressive. Yes, it's pretty cool to have dinosaur tracks only a couple miles from my house. Translation: I can easily go see them anytime I want! But part of the coolness is pondering the millions and millions of years it took to create them and then expose them. Geologists call these vast spans of Earth history "geologic time." I first heard this term from a park ranger at the Grand Canyon. My sister-in-law, a geologist, also likes to refer to geologic time. Cosmologists and astrophysicists use the term "deep time" when referring to the events of the history of the universe, which involve billions of years. I love studying the history of the cosmos and our planet, and while walking with Mr. Deschner, I realized that I'm finally able to imagine the unimaginable - the vast spans of geologic time and deep time. It has taken me a while to gain this understanding. I remember standing on a trail on the way to the bottom of the Grand Canyon in 1996, and I sort of got it when the park ranger joked that the rocks were "older than God." But I couldn't comprehend the reality of 500 million years. He could have said 5 million or 5 billion and it would have made the same impression on me. I was just a man who would live maybe 90 years if I was really lucky, and 500 million years was too many years. It didn't mean anything to me. But now, standing at the edge of the shallow creek bed, when the man pointed at the tracks and said "100 million years," my study of Earth history and the history of universe was paying off. His cool story about the origins of the dinosaur tracks came alive for me. The next time my sister-in-law talks about the origins and ages of rocks, I won't feel stupid. I'll get it.